It's fairly common to see unwanted or unknown apps are shipped with your phone in default when you get a new Android device, which makes the overall experience really bad. To make things even worse, it's very hard to remove those apps as a beginning user. You have to master some technical skills to get them deleted in the past a few years. But now, you can easily get that with the help of CyanogenMod, the best free and clean operating system based on Android mobile platform. You don't need to root or unlock your Android device before installing the package, which makes its much more user friendly than other ROMs. And that's the reason why I recommend CyanogenMod here.  Secure: If you install Cyanogenmod, it's really secure when browsing, using emails, making purchases. 	Light footprint: It is a safe, light footprint and bloat-free way to install a custom CyanogenMod. 	Bloat-free: Using CM 10 on Android phone will run great better then the bloatware phone brings out. 	Customizable, Open: It is a customizable and open source, user friendly. CyanogenMod can be customized into anything. This translates into an abundance of features that let you truly own your phone. By following the steps I mention below, you can easily get CyanogenMod installed on your device. Note: Back up your data before you start! Android Manager is a great app on this. Open the Settings app on your device and navigate to Security option. Locate the Unknown sources option. If Unknown Sources is already checked, you can skip this step. If unchecked, tap the checkbox and then tap OK on the confirmation popup. From your Android phone or tablet, visit https://get.cm by using the web browser. Then the download will be started automatically. Click the downloaded apk and install it on your device. Click the downloaded apk and install it on your device. Once it's finished, tap Open to run the app. Open the CyanogenMod app and follow the instructions displayed on your Android phone or tablet to continue the installation process. Click here to download the CyanogenMod Installer for Windows Vista/7/8. 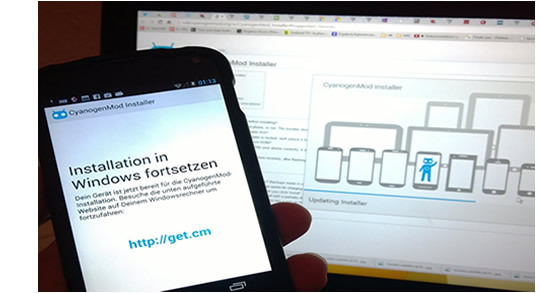 Run the CyanogenMod Installer for Windows and follow the on-screen instructions. Please be patient, as the installation will be lasted for minutes. You can now enjoy CM freely now after the steps are completed. The user interface is much clean when compared to the original version of the device! Only necessary apps are installed. Unwanted or malicious apps were removed from the distribution.